Facing a 24 point deficit at the interval, Banbridge produced a storming second half performance to score four tries, with the conversion of the fourth giving them a two point advantage with less than two minutes of normal time remaining. But a penalty in injury time gave UCC their only points of the second half and that was enough to reclaim the lead and pick up the four points. It was a cruel end after Bann had fought back from a seemingly impossible position, but ultimately they paid the price for an uncharacteristically poor defensive display in the first half. Coach Daniel Soper felt his side had let themselves down badly in the first half. “There were too many scores from soft missed tackles,” he said. “We just opened the door and allowed them to take the inside channel. “We got a bit of mileage out of our maul but we lacked width and made it easy for the opposition to defend. It took the students just three minutes to break down a Bann defence that had managed a shut-out against Naas the previous Saturday, with winger James Kiernan finishing off in the left hand corner for Kevin O’Keefe to land the conversion with the aid of an upright. There was no further scoring until the half hour was up. But Adam Ervine’s efforts to stop a flowing UCC move saw the Bann winger pick up a yellow card and O’Keefe slotted the penalty from 30 metres. Five minutes later the students’ skipper, centre Kevin Slater, found the Bann defence accommodating as he sliced through and raced 55 metres to touch down, with O’Keefe again adding the extras off the tee. And the visitors’ first half misery was complete when No 8 Eddie Earl picked up from the base of a scrum and strolled in from five metres range for a third converted try. Chris Allen’s charge down of a clearance kick almost put the Bann lock in for a try at the start of the second half but as the visitors maintained the pressure scrum-half Lee Steenson was able to nip in from close range for a try which Shandon Scott bettered to kick-start Bann’s revival. On 53 minutes John Porter was en-route to the try line when he was taken out by a high tackle 10 metres out and the students continued to be penned in their own “22” until Steenson’s pass put Stephen Irvine over from close range for a 24-12 scoreline. UCC broke out to enjoy some time in the Bann half but the visitors’ defence had now re-discovered its traditional resilience and when play returned to home territory Bann added two more tries in two minutes. Going through the phases off a lineout, the visitors pummelled at the line until No 8 Irvine crossed for his second try. Scott struck over the conversion and Bann were back on the attack straight after the resumption. UCC were reduced to 14 men after the referee again waved the yellow card and from the penalty in front of the posts and just five metres out Ryan Patterson forced his way over to tie the scores. Scott’s conversion edged his side ahead for the first time in the game but all that hard work was undone with the concession of that injury time penalty, with O’Keefe again finding the target. Soper reflected on his side’s three narrow defeats. “We’re still second equal in the league and that’s good but we’ve now lost nine competition points in the last three minutes of three games – those nine points would make the table look a lot different. “We need to get better at game management but a lot of that is about time in the saddle playing. We didn’t hit our target for this latest batch of three games but things are still within our control. 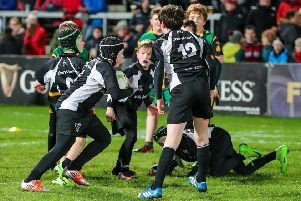 On a rain-swept and cold morning at Rifle Park, Bann’s Under 14s claimed a 76-0 win over their plucky counterparts to record their first home league win of the season. For the record the home team’s scorers were Lewis Kemp (4 tries), Dean Hayes (3 tries), Jack Sherrard (2 tries), Adam Benson (1 try), Benjamin Thompson (1 try) and Liam McClory (1 try). Philip Jackson also got on the score-sheet with eight conversions. . The squad played exceptionally well from the first minute, with each member putting in a strong performance. The pack was superb in the tight, winning six scrums against the head and winning more than their share of line out ball. Both backs and forwards rucked well and linked seamlessly to score a number of well-worked tries. Well done to all concerned but special mention should go to skipper Lewis Kemp, who had an outstanding match at centre in the first half and out half in the second half.